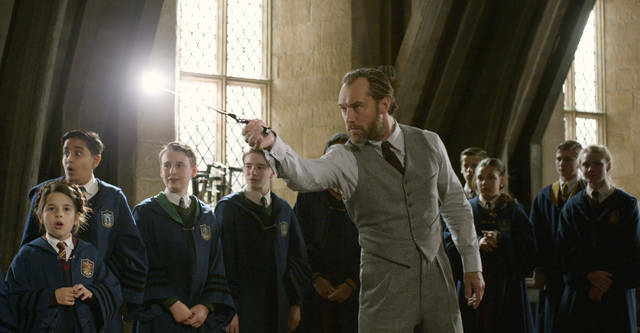 LOS ANGELES (AP) — When Jude Law met with J.K. Rowling about portraying the younger version of Albus Dumbledore, the two discussed how to rebuild the fan-favorite character from the “Harry Potter” films. Law spent an afternoon jotting down notes from Rowling who talked to him about Dumbledore’s life before becoming the world’s most powerful wizard. The British actor walked away with a vote of confidence from the famed author, alleviating some pressure on him. Dumbledore was a Hogwarts headmaster in the “Potter” franchise commonly known for his silver hair and long beard, sporting a loose robe. He was played by Michael Gambon after inheriting the role from the Richard Harris, who died in 2002. 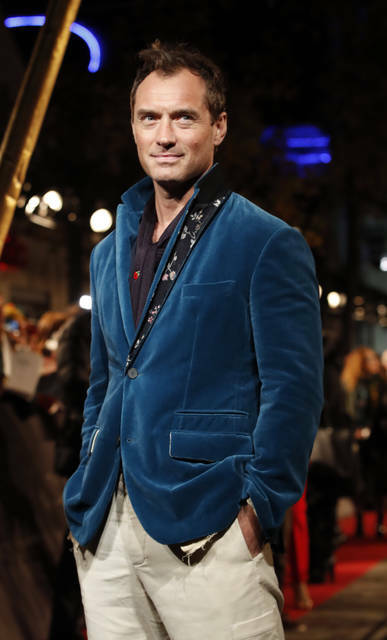 Law’s youthful version enters in his mid-40s wearing a three-piece suit with short auburn hair in the sequel “Fantastic Beasts: The Crimes of Grindelwald ,” which will be released Friday. It’s the second part of a five-film franchise that started with 2016’s “Fantastic Beasts and Where to Find Them,” which grossed $813 million worldwide. In “Grindelwald,” Law’s character works with his former student Eddie Redmayne’s Newt Scamander to thwart the divisive wizard leader Gellert Grindelwald, played by Johnny Depp. The film also stars Katherine Waterston, Zoe Kravitz and Ezra Miller. Redmayne said the studio perfectly cast Law as Dumbledore, who doesn’t necessarily show his true powers and appears only in about six scenes — most of which are interactions with Scamander. Law says the film opens the door to many dramatic paths and explores a more troubled time in Dumbledore’s life along with his once-close relationship with Grindelwald. Rowling announced in 2007 that Dumbledore is gay after the release of “Harry Potter and the Deathly Hollows,” the final book in the series. Some on social media criticized the author’s decision to unveil and tinker with the beloved character’s sexuality, but she has defended her actions. Law assures the story is more focused on his character’s complicated relationship with Grindelwald from decades ago, rather than Dumbledore’s sexuality. Law called his introduction as Dumbledore a good “warmup” as the franchise progresses. The actor has a few big films ahead on his plate including “Captain Marvel” and “Vox Lux,” but is looking forward to filming the third installment of “Fantastic Beasts” next summer. It’ll give Law time to grow his beard. AP Entertainment Writer Ryan Pearson contributed to this report in Los Angeles. Time magazine described it as a tour “fit for a rock star”. This is not how book promotional outings are usually billed – but then this is no ordinary tome. The memoirs of Michelle Obama comprise one half of a US$65m joint publishing deal for the former first couple’s autobiographies. One measure of predicted global interest is that Michelle Obama’s book, Becoming, will be translated into 28 languages. The month-long tour plan is bold, taking in ten major arenas, with an all-star line-up of moderators including Oprah Winfrey, author Chimamanda Ngozi Adichie, businesswoman Valerie Jarrett, actress Sarah Jessica Parker and more. One is left in absolutely no doubt that the legacy of this First Lady stands robustly alongside that of her husband. Very few of her predecessors can make this claim. Traditionally, the First Lady of the United States (FLOTUS) has been presented as an appendage of the president, whose priority was spousal loyalty, whatever the challenges involved. She spent her time entertaining, engaging in charitable endeavours, and attempting to provide some sort of normality to children being raised in a profoundly abnormal environment.